From left are Branson Anway, Alex Sparks, Dillon Fagan, Chase Greek, Layne Brayton, Kassidy Little, Jacob Stewart, Chris Kelly, Ryan St Myers, Abigail Smitley, Andy Back, Audrey Dulebohn, Roegan Hines, Alivia Hines, John Roby, Makenna Nichols, Aislen Setty, Dylan Gaston, Faith Smith, Adrien Wojtkowski and Elise Kemp. 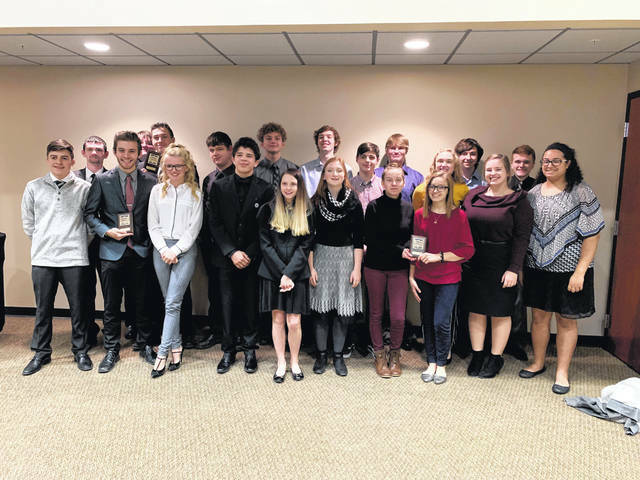 ST. PARIS – Students and advisors of the Ohio Hi-Point Career Center Graham High School Business Professionals of America (BPA) chapter participated in the BPA Regional Leadership Conference in Lima on Jan. 23. Roegan Hines and Aislen Setty of the Ohio Hi-Point’s Information Technology and High School of Business satellite programs at Graham High School advance to the state Leadership Conference in March after placing first in PC Servicing & Troubleshooting and Graphic Design Promotion, respectfully. A total of 44 members of the Ohio Hi-Point Graham BPA chapter were among the more than 1,000 students, advisors and guests from across the region participating in the Region 16 Leadership Conference.